It’s time to start filing out those applications for scholarships, financial aid and yes, graduate school. 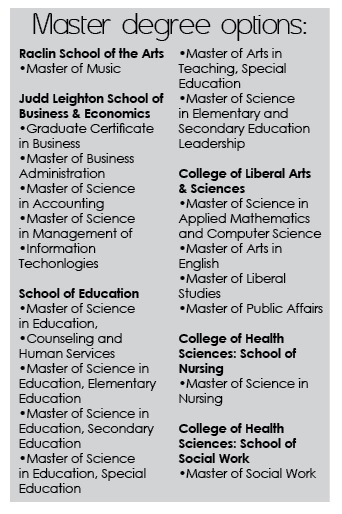 Those choosing to attend graduate school may not be aware that IU South Bend offers many graduate programs. IUSB offers 17 master’s programs through their five schools with online and evening classes offered to help students finish their degrees more quickly. There are graduate programs available for the Raclin School of the Arts, the Judd Leighton School of Business, the College of Liberal Arts & Sciences, the College of Health Sciences: School of Nursing and the College of Health Sciences: School of Social Work. Brandi David, a graduate student studying English in the College of Liberal Arts and Sciences, says she chose to attend graduate school at IUSB mostly for financial reasons. “It’s a lot cheaper than a lot of other programs, but there is also familiarity because this is where I got my undergrad,” David said. “Although my program isn’t currently offered, I’m able to get an MA degree while getting teaching and conference experience. According to www.iusb.edu/graduate-studies IUSB is the only public four-year university within an hour’s distance from South Bend. Most of the classes are held at night due to the large number of nontraditional students at IUSB who work full or part-time jobs. The graduate level classes are usually small which allows for students and faculty to work closely together and get to know each other better. David said that her experience as a graduate student hasn’t felt much that much different than her undergraduate experience at IU South Bend, except she feels like she has a better relationship with her professors. The credit hours for obtaining a Master’s degree vary according to the program. The requirements for applying are also different depending on the degree being sought. Some master’s degrees only require 36 credit hours and can be completed in just two years while other programs may require 48 credit hours. Most schools have online applications that require essays or writing samples along with an application fee and letters of recommendation. Some applications are due as early as December first. Financial aid is available by filling out a FAFSA. IUSB also offers graduate scholarships, grants, loans, graduate assistantships and work-study opportunities. For more information email graduate@iusb.edu or visit www.iusb.edu/graduate-studies.